Robyt: Students build dancing robot as a tribute to Robyn #MusicMonday #robotics « Adafruit Industries – Makers, hackers, artists, designers and engineers! 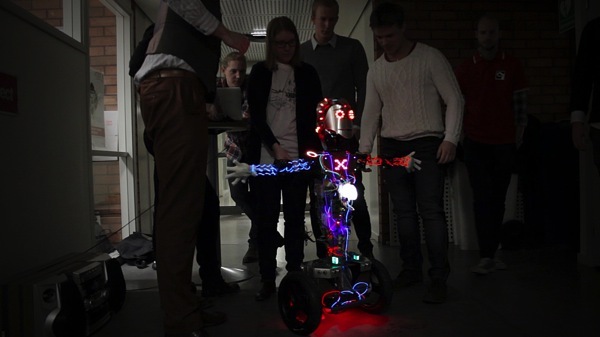 Students at Sweden’s KTH Royal Institute of Technology have created this rocking robot that dances to the beat of Robyn’s music. Dubbed “Robyt” by popular vote (the students took an online poll to let the public name the robot), even Robyn herself was excited about this awesome project and visited with the students to show her support. Via Phys.org. An annual assignment for a selected group of fourth-year students, the robot-building project typically goes unnoticed outside of the mechatronics programme. But this year was different. “When we started, we wanted to use Robyn’s music in order to get her attention for the project,” says Elias Flening, one of nine students on the team that built Robyt. The singer took a personal interest in the project and came to KTH to meet with the students on two occasions, to share her ideas about how the droid should look and behave. Robyt’s arm and head movements are activated by the pulse of any musical playback, though the team relies solely on Robyn songs to initiate the dancing. The unit’s wheel base rocks back and forth rhythmically to compensate for the movement of the arms, with the result that it has on occasion toppled over. Not that Robyn seems to mind. The singer has given the finished product a big thumbs up.